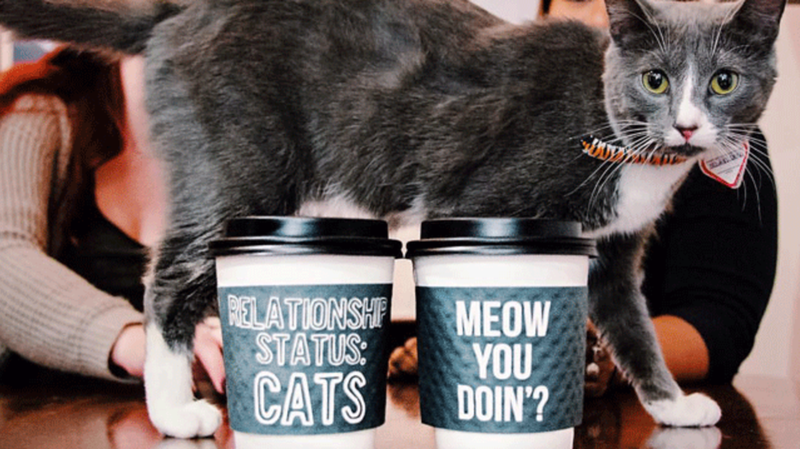 The idea of getting cat cuddles from the same place you get your coffee is nothing new. Cat cafes have been a major hit in cities like Tokyo and San Francisco, and now Los Angeles is next in line to get a feline-centric coffee shop of its own. As Eater reports, Washington D.C.-based Crumbs & Whiskers will be expanding to L.A. in the fall. At Crumbs & Whiskers' original location in D.C., adoptable cats from local shelters roam and laze about the restaurant while customers enjoy beverages, treats (all prepared offsite), and some quality pets. Walk-in visits to the Los Angles spot will get you 15 minutes of cafe time for the price of $5.50. But considering how popular cat cafes have been in the past, reserving a time slot in advance is likely your best bet. For $15 plus the cost of food and drinks, guests can book 75 minutes to relax and enjoy the company of the cafe's furry residents. The establishment will be the city's first permanent cat cafe, but temporary pop-ups have opened there before. In the fall of 2014, the Catfe attracted long lines to LA's Chinatown of people looking to experience its brief four-day run. Cat-deprived Angelenos who missed that cat cafe train will have a second chance to board in a few months. Watch the video below for an idea of what to expect.